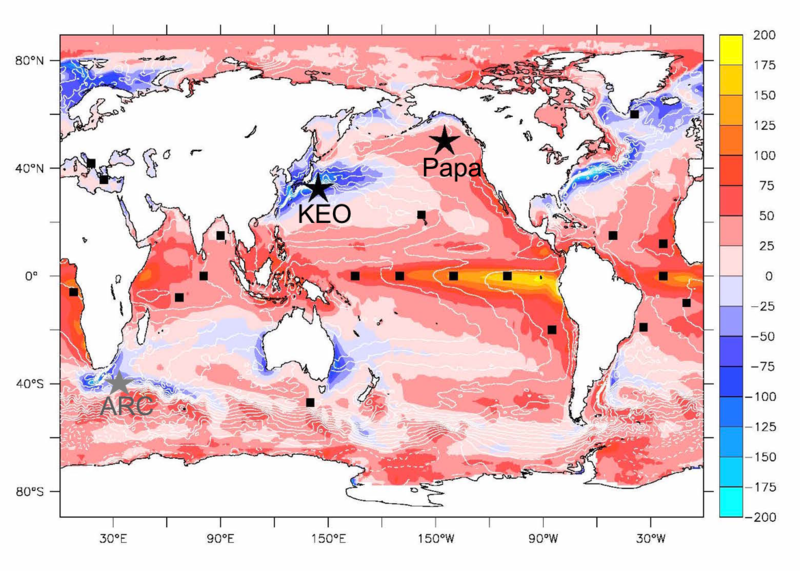 OCS mooring sites (stars) shown on a map of net surface heat flux (W/m2). Other air-sea flux OceanSITES stations are indicated by black squares. The mission of the Ocean Climate Stations Project (OCS) is to make meteorological and oceanic measurements from autonomous platforms. These reference time series and innovative measurements are used to improve satellite products and forecast models, and improve our understanding of air-sea interactions, and their role within the climate system. With more than 70% of the Earth covered by oceans, global weather and climate are strongly affected by exchanges of heat and moisture between the ocean and the air. Improved understanding of the climate system will help society adapt to climate variations and changes. Improved, more physically realistic forecast models will help reduce society's vulnerability to weather and climate extremes, preparing a weather-ready nation. The OCS program encourages broad use of the data and welcomes collaboration. Visit our data pages, and contact us to learn more. After eight straight months of sailing in the Pacific Ocean, two Saildrones have made their way back to their home port in Alameda, CA, filled with scientific data. These unmanned observing platforms were launched on September 1, 2017 on a mission to the equator and back. The purpose of the mission was to learn more about how Saildrones might be used to improve the Tropical Pacific Observing System (TPOS), which is used by the US and partner nations to forecast weather and climate. Overall, the project scientists consider this to have been a very successful mission. Though still sorting out a few measurement glitches, the researchers are very pleased with the data so far. Initial findings show that the oceanographic and atmospheric measurements made by the Saildrones are high quality. This platform may be a good tool for providing key observations for long-term weather forecasts. In fact, several interesting very abrupt temperature fronts were discovered during the mission. Scientists were surprised to see the temperature of the surface sea water change by about 1°C (1.8°F) in less than 1km (0.62mi). They are now studying how these fronts impact the local meteorology and chemistry of the surface ocean. This is the sort of detail that can’t be observed from satellites, but which may influence weather patterns forming in the area.